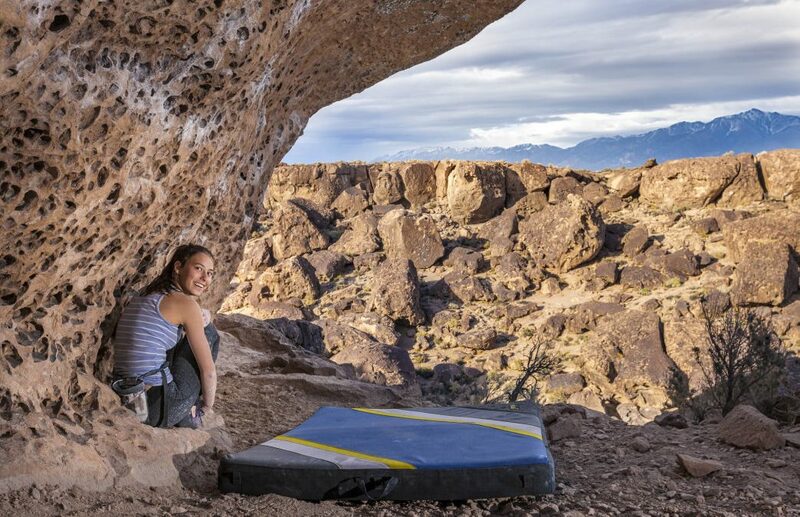 The Happy and Sad Boulders offer hundreds of boulder problems that will delight and challenge climbers who come to Bishop to test their skills. With everything from jugs to crimps to pockets, you can find just about anything here. There are caves and cracks, and while some of the rock might not look that secure, it’s pretty solid. The landings are usually flat, the top outs are flat—what more could you ask for? The Happy and Sad Boulders are located in the Volcanic Tableland, just north of Bishop in an (almost) mile long canyon. The volcanic rock in this area created channels, cracks and underhangs that draws climbers from all over the world to experience the Bishop Tuff for themselves. A little bit easier on the hands than the rock over at the nearby Buttermilks, the Happy and Sad Boulders offer more of a challenge for your muscles rather than your skin. The Happy Boulders are a little more accessible for a less experienced climber, and, as the name suggests, it’s hard to have a bad day out here. Most of the problems here range from V0 (Pursuit of Wow, Corner Route) to V8 (Disco Diva), but there are a few tougher ones, like Toxic Avenger (V9/10) and Acid Wash (V10). If you want to get your heart pumping, jump on the not-t0-difficult highball Heavenly Path (V1). The Happys are a great place to go out with a crew of varying abilities because of the range of problems, and the high concentration of them. It’s very easy for multiple people to work on their projects within a stone’s throw of each other. The Sad Boulders, on the other hand, offer up some much more challenging problems. While there are some classics in the V0-V3 range (like China Doll and Still Life), you’ll also find some trickier V10s, like Beefcake, a low and steep climb inside a catacomb-like cave. The Sads are also usually cooler thanks to these caves and less direct sunlight on the rock. The flora and fauna in this area are fragile, so leave no trace and pack out anything you bring in to ensure it stays beautiful for generations to come. Combined with the epic climbing and the stunning backdrop of the Eastern Sierra, including incredible peaks like Mt. Tom and the Wheeler Crest, it’s easy to see what makes this area so popular. Between the two spots there is something for every type of climber. There is an abundance of low traverses and link-ups, plenty of overhangs with friendly handholds, crimpy routes, cracks, and a tons of finger pockets. The landings are flat and there’s a pretty wide range of difficulties here too. 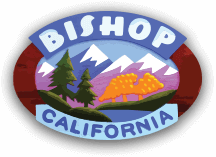 Head north from Bishop on Highway 395 and make a right onto Pleasant Valley Road. Turn right again onto Chalk Bluff Road after passing by the Pleasant Valley Campground. On your left hand side is a cliff band, continue for about two miles until you hit the parking and access area for Happy Boulders. The pit toilet is located here as well. Continue on to the second kiosk area to access the Sads. What is RootsRated? 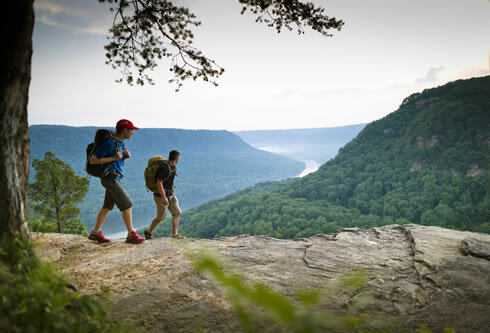 RootsRated is a media platform that connects users with the best outdoor experiences, hand-picked by local outdoor retailers and their networks of local experts. We are NOT another website full of crowd-sourced trail reviews. We harness the collective expertise of high-level local runners, skiers, riders, paddlers, and climbers. Then we share it through exclusive stories and destination reviews—curated city by city—about the best trails, runs, routes, crags, and more. RootsRated brings people who love the outdoors together, through insights from locals who are most in the know. 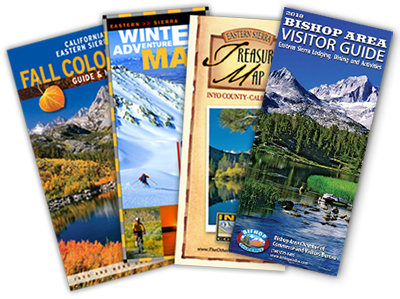 Check out the Digital Bishop Visitor Guide! How do you enjoy OUR BACKYARD? Enjoy this bird's eye view of Mt. Whitney! "Hey Ma&comma; top of the world&period;"
This Policy explains how we collect, use and disclose information about you when you visit our website. By visiting, using or navigating our site, you consent to the collection of NON-Personally Identifiable Information (non-PII). By completing any registration or submission form, (for example email submission forms that may appear at any of our pages to receive special deals, promotions or information), you consent to the use of your personal information in accordance with this policy. Cookies can be used to recognize your browser when you visit our site, remember your preferences, and give you a personalized experience in accordance with your settings. Cookies also make interactions with our site faster and more secure. Cookies also allow us to bring you more relevant advertising on our site or other sites. our servers receive and record information about your computer, device, and browser, including your IP address, browser type, other software or hardware information, and your geographic location. These cookies collect information about your use of our websites and apps and enable us to improve the way it works. For example, analytics cookies show us which are the most frequently visited pages on our website, allowing us to provide the most popular information relevant to you. They help us record how you interact with our websites, such as how you navigate around pages and from page to page; identifying improvements we can make to the customer journey. They also help identify any difficulties you have accessing our services, so we can fix any problems. These cookies also allow us to see overall patterns of usage at an aggregated level. These are bits of data that count the number of users who access a website or webpage and can also allow us to see if a cookie has been activated. Web beacons used on web pages or in emails allow us to see how successful a campaign has been or that an email message was successfully delivered and read in a marketing campaign. Web beacons are also used to verify any clicks through to links or advertisements contained in emails. We may use this information to help us identify which emails are more interesting to you and to inform advertisers how many customers have clicked on their advertisements (this information is aggregated and does not identify you individually). Tracking URLs are a special web link that allows us to measure when a link is clicked on. They are used to help us measure the effectiveness of campaigns and advertising and the popularity of sections of the site. If you access our website or engage with our advertisements on your mobile device we may collect a unique device identifier assigned to that device, geo-location data, and other transactional information for that device. We may also use the unique identifier to validate free trials, or assess if you have visited a location, for example. We use these types of technologies to provide advertisements that are more relevant to your interests. This can be done by delivering online advertisements based on your previous web browsing activity, known as “online behavioral advertising" (OBA). Cookies are placed on your browser which will remember the websites you have visited. Advertising based on what you have been looking at is then displayed to you when you visit websites who use the same advertising exchanges. For example: You may be doing online research in order to visit a destination and read a number of articles about destinations across various websites. As you browse those sites a cookie from advertising technologies would be placed in your browser. It would remember that you had visited several websites related to destination traveling. Then, when you visited another website in the same advertising exchange, the website could show you an advertising related to travel. These cookies collect information about your choices and preferences, and allow us to remember things like language, your username (so you can log in faster), text size, and location, so we can show you relevant content to where you are. They allow us to customize the services you have accessed. We also use these cookies to provide you with services such as video clips or video content. We may, in certain situations, use Adobe Flash Player to deliver special content, such as video clips or animation. To improve your user experience, Local Shared Objects (commonly know as Flash cookies are used to provide functions such as remembering your settings and preferences. Flash cookies are stored on your device, buy they are managed through an interface different from the one provide by your web browser. See your device for more information. In an effort to provide you relevant, and constant email communication, we have in various sections of our site, email submission forms. Only emails that are submitted by you, or someone on your behalf, will be kept in our email database. We may use additional cookie data, such as IP address, zip code or hashtag IDs, or Device ID data, and assign such data to your email, in an effort to provide you a better, more personalized web/site experience, or for retargeting purposes across our advertising campaigns. If you participate in a survey or request information, your email address, physical mailing address and any other information you volunteer will be collected. To provide us aggregate site behavior and insights. Retarget you across 3rd party sites, using cookie retargeting data. Provide aggregate reports of usage activity. Help understand how visitors engage with our sites or apps. Detect and defend against fraud and other risks to protect users and partners. Improve our site, services or products. The content on our websites and in our communications with you may be adjusted depending on what we know about the content, products and services that you like. This means we can highlight content and articles that we believe will be of interest to you. We provide personalization by using cookies, IP addresses, web beacons, URL tracking and mobile app settings. Data from advertising technologies on and off our site, like web beacons, pixels, ad tags, cookies, and device identifiers. User-provided information (Ex: Email, Name, Phone Number). Data from your use of our site (e.g., search history, page visits, videos you watch, frequency of visitation, recency of visitation, clicking on an ad, etc.). Information or cookie data from advertising partners and publishers. Information inferred from data described. We adhere to self-regulatory principles for interest-based advertising (behavioral and contextual) and participate in industry opt-outs from such ads. This does not opt you out of receiving advertising; you will continue to get other ads by advertisers not listed with these self-regulatory tools. We do not share your personal data with any third-party advertisers or ad networks for their advertising except for: (i) hashed or device identifiers (to the extent they are personal data in some countries); (ii) with your separate permission (e.g., email submission form) or (iii) data already visible to any users of the site (e.g. comments or pictures posted on our site). However, if you view or click on an ad on or off our site or apps, the ad provider will get a signal that someone visited the page that displayed the ad, and they may through the use of mechanisms such as cookies determine it is you. Advertising partners can associate personal data collected by the advertiser directly from you with our cookies and similar technologies. If you have provided your personal email to receive communication with us or any of our partners, we or any of our partners will provide you email communication following the CAN-SPAM Act compliance. Each email will have a visible unsubscribe button that will allow you to stop communication from us or any of our partners at any moment. We retain cookie data for a period of 26 months. We retain Personal Data until the user has opted to be forgotten or has requested data to be deleted. You can ask us to erase or delete your personal data. You can ask us to stop using all or some of your personal data or to limit use of it. You can ask us for a copy of your personal data and can ask for a copy of personal data you provided in machine readable form. To request data, please see contact information below.